With my ticket and paperback copy of Rin Tin Tin in hand, I rushed into the Columbus Museum of Art and found a nice aisle seat for the event. When Susan walked down the aisle to take her seat, the women in front of me commented on her skirt. It was a showstopper! Ron Shaull, former Thurber House Board of Trustees member, introduced Susan Orlean and proceeded to invite Linda Hengst from the Ohioana Library to the stage. 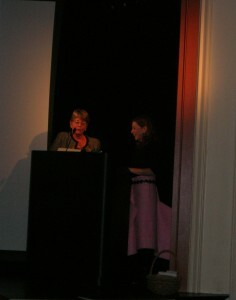 Orlean won the 2012 Ohioana Award for Nonfiction and wouldn’t be able to return for the award ceremony on the 26th. This was only the second time the award was presented outside of the Ohioana Awards Ceremony. In addition to receiving the award, Orlean also learned earlier in the day Rin Tin Tin had made The New York Times Bestseller list. So it was a special night. Orlean began with how Rin Tin Tin captured her attention as a child and moved on to a 5-minute video which gave an overview of Rin Tin Tin’s career. Orlean then read some passages from the book before answering questions from the audience. My review of Little Bee is very short and understated. There was so much to talk about but I was afraid I would spill some beans. 🙂 Everyone I recommended the book to loved it. 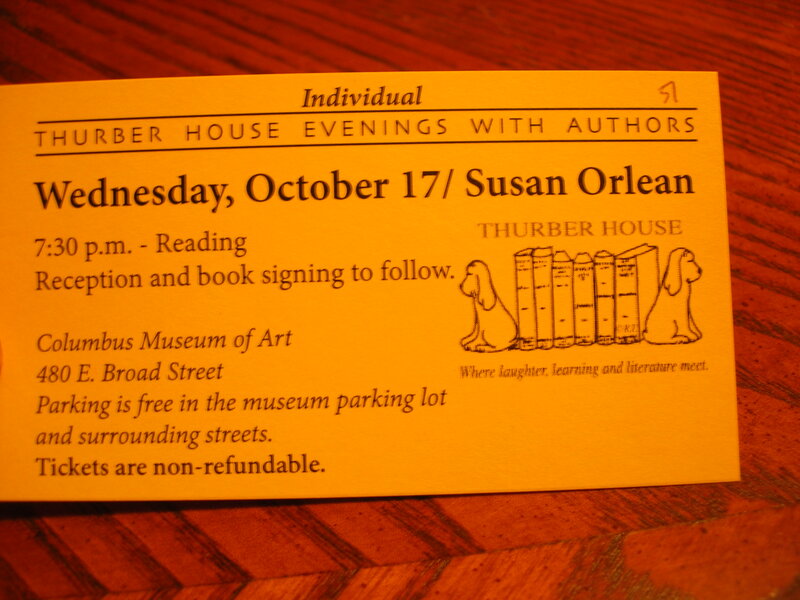 It was a no brainer for me to get a ticket to the Thurber House Evening with Authors featuring Chris Cleave. It was nearly a packed house at the Columbus Museum of Art. His energy radiated from the stage. He joked about being let out of his (writing) shed to go on tour for Gold. His latest novel is about two women who are friends and rival speed cyclists. Cleave discussed how he came to pick that sport and read a portion of the novel so we’d get a feel for it and to introduce one of his favorite characters. He spoke about rivalry and his own cycling training before he took questions from the audience. Cleave was very funny. I’m not sure how many people were in attendance but the museum theater was very full and everyone seemed engaged. Some of the questions included: Why does he usually write female main characters? Who is his favorite character out of all of them? Does Little Bee survive and would he be interested in writing a sequel if she does? All good questions with good answers. I’ll paraphrase short answers to the first two questions. Why does he usually write female main characters? He wanted to write characters who weren’t him so he’d pay attention to the details that make their lives real. His goal is to combine those details with emotional truths and if he were writing another version of himself he wouldn’t pay attention to those details because he already knows them. With this book he wanted to write male main characters but then Zoe happened. Who is his favorite character out of all of them? Zoe from Gold. She’s a mess. If she were a male athlete no one would think to criticize her for her behavior. She does what she wants without thinking about the consequences to the people around her but she’s starting to realize she needs to change. Cleave did sign books and spoke with everyone who wanted to chat with him. A book club waited in line together and had a picture taken with him. It was cute. He and I chatted for a few minutes while he signed my copy of Gold. I made a comment about Little Bee being devastatingly heartbreakingly beautiful and he said that made his night. Chris Cleave has a tumblr full of behind the scenes photos of his tour if you’d like to see where he’s been on his travels. A big thank you to Marcia for originating Mailbox Monday. This weekly meme is now on tour with a new host each month. May’s host is Martha’s Bookshelf. I went to B&N this week to pick up Erik Larson’s new book, In the Garden of Beasts, since he was in town to do an author reading for the Thurber House. I miscalculated his popularity and the event was sold out. I didn’t get to go but I kept the book since I knew I’d read it eventually. While there, I picked up Miss Peregrine’s Home for Peculiar Children by Ransom Riggs. It’s received a bit of buzz the last few months. Lastly, I picked up ebooks of most of Mur Lafferty’s novellas. Earth, War, Wasteland, Hell, Heaven, Marc and the Red Granny and Playing for Keeps. The first five follows two best friends who die, go to heaven, become bored, and take off for places unknown. What arrived in your mailbox this week? These statistics are all for short stories, poems, or contest entries. Book reviews are not included. This is the month in which I tell myself I’m awful and wonderful at the same time. I’ll start off with the bad. I was a bad blogger. None of my reviews were written before the month started. I found it impossible to write during the evenings and come up with coherent sentences for blog posts. (Most of my 29 posts in draft status are unfinished reviews.) My post about the World Fantasy Convention is still in draft status too. The great thing about blogs is the immediate factor – people can read about events minutes or hours after they happened. I was a bad submitter. I didn’t send out anything new. There was a contest I found out about a day before the deadline and I had a flash fiction piece that needed another pass before I would send it out again. It never got looked at so it didn’t get entered. The good stuff… I finally made it to the Thurber House. I learned about the Mustard Seed Retreat which is a great alternative to squirreling yourself away in a hotel room to write. This month was NaNoWriMo month. It gave me the opportunity to reacquaint myself with and meet local writers. It reminded me I do need the camaraderie of other writers. Last year I promised myself a laptop for finishing NaNoWriMo. I’m finally getting getting around to picking one out. This month I came to the decision to do something about the first draft/outline manuscripts that have been unloved on my hard drive and back-ups. I signed up for a month-long workshop on editing that begins in January. These statistics are all for short stories, poems, or contest entries. Book reviews (and interviews) are not included. The Thurber House has a contest each year to kick off the summer season. This was the first year I entered and since I wasn’t invited to come to the picnic for a reading I can assume I wasn’t picked as one of the top entries. At the end of June I signed up for a Flash Fiction workshop with Jim Harrington, one of the editors at Apollo’s Lyre. Flash Fiction is what I submit and I thought it wouldn’t hurt to have an insider’s opinion on a new piece before I did anything with it. Friday evening was fun. When I arrived they were accepting raffle entries to win two tickets to the next “Evenings With Authors” night. 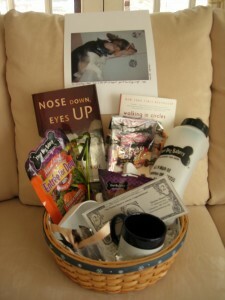 Three Dog Bakery was a sponsor and there was a big basket with little treat bags. Tom Holiday with the Board of Trustees served as the host. He introduced Markoe and they started right off with doggie photo contest winners. Sammy won for “Most Likely to Talk”. I was really shocked at the number of goodies from Three Dog Bakery and Thurber House. Markoe began reading her piece about Puppyboy titled “Something Very Important”. It was a little bit difficult to hear at times – she may have been too close to the microphone. Tom fixed it which resulted in a good natured exchange where Markoe commented that he threw her off and she had to begin it again (she didn’t, really). After he took his seat, Markoe gave him the hand signal and the “stay” command. It only added to the hilarity of Puppyboy’s story. 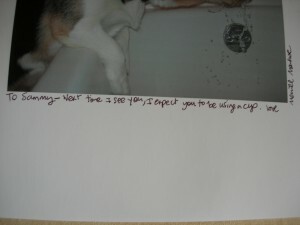 When finished, she asked if she should take questions or read more. Many voices requested she read. So read she did. Markoe picked a bit from Nose Down, Eyes Upwhere the main character walks in his dog, Jimmy, giving a motivational speech to the other dogs about what is edible or inedible. It’s currently being made into an audio book and Markoe was impressed the reader actually does voices for the characters. During the question and answer session, Markoe was asked just about everything imaginable… “What is the strangest thing one of your dogs have eaten?”… “How did you get started writing?”… “Would your mother be proud of your success?”… “Have you always been this funny?” and so on. Tom had Markoe pick out the raffle winner. Then Markoe signed books while a cookie and coffee reception was held nearby. I bought a copy of Nose Down, Eyes Up for her to sign earlier in the week and since I now had a signed copy I went on to the reception. 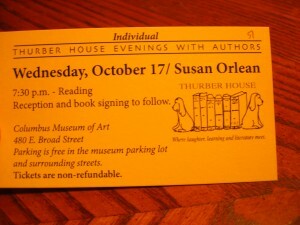 It was a great evening and I’ll definitely be going to another Thurber House event. James Thurber was a student at The Ohio State University before going on fame and fortune at the New Yorker. The house he lived in with his parents and siblings is listed on the National Register of Historic Places. In 1984 it was turned into a museum and literary arts center. They sponsor several programs all year long. It’s a shame that I’ve talked about wanting to go to some of their events and haven’t made the time. This year will be different. One of the programs offered by Thurber House is an evening with an author. Not all of the programs are held at the house. There is one tomorrow night at the Columbus Museum of Art. Merrill Markoe will be there to do a 50-minute reading of Nose Down, Eyes Up, answer questions and do a book signing during a reception. As a special event for the evening, ticket holders were invited to enter their dogs into a doggie photo contest. Markoe will award two dogs with the honor of “Most Likely to Talk” or “Most Likely to Be Portrayed in Markoe’s Next Book”. 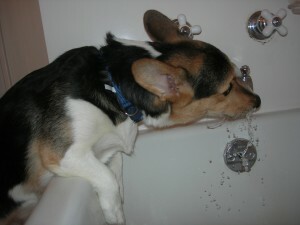 I could not resist entering the Resident Corgi into the contest. I’ve seen the pictures of the other dogs and there are some cuties!